Last time we saw The Fine Bros they were making us feel mega old by introducing kids to rotary phones. 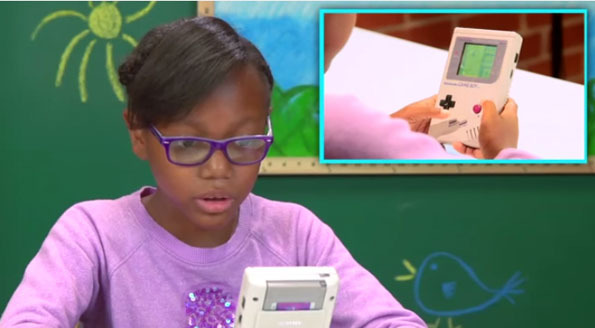 Now they’re back and making us feel even older by handing kids a first generation Game Boy. At the risk of sounding like a geezer: kids these days, amirite? Imrite! They got so much technologies and whatnot that they don’t even play outside anymore! How am I supposed to yell at em to get off my lawn when they’re not even there? Exactly! I can’t. And what good is an old person if they can’t give a bunch of whippersnappers a what for? I don’t even wanna know, but I think it means that it’s time for me to go be with the Lord. Unfortunately I think the Devil’s got first dibs, so I’m gonna ride this out as long as I can.